SKECHERS has grown from a one-style, one-office company, to one of the world's most sought-after footwear brands. 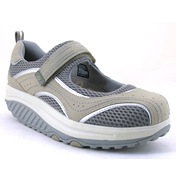 SKECHERS was a slang word that was popular on the streets for a kid who is super energetic and can't sit still. It defines the person who is into one thing, one day, then quickly onto something else. The name was chosen because SKECHERS brand caters to style-conscious men, women and children who are constantly seeking what's next in fashion.